alaTest has collected and analyzed 22 reviews of Cherry MX Board 6.0. The average rating for this product is 4.4/5, compared to an average rating of 4.2/5 for other products in the same category for all reviews. People really like the design and reliability. The usability and size are also appreciated. Some have doubts about the price. We analyzed user and expert ratings, product age and more factors. Compared to other products in the same category the Cherry MX Board 6.0 is awarded an overall alaScore™ of 93/100 = Excellent quality. When offered the chance to do a Cherry MX Board 6.0 review, I jumped at the opportunity. 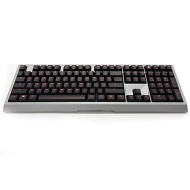 Find out how a Cherry board with Cherry MX Red Linear switches performs!